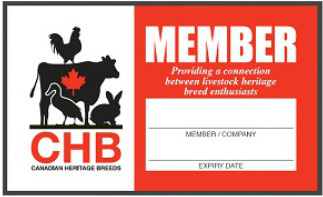 Please consider joining Canadian Heritage Breeds today! The satisfaction of contributing financially to the important work of CHB! Thank you so much for your support! * Memberships expire December 31st of each year. After you have filled out the membership form, you can pay use Paypal to pay your fee here: Payments Thank you! Join the active CHB Facebook group too! Please ignore the American address system, these forms don't come Canada friendly! CHB would like to know how we can reach out to new members. Please state how you found out about CHB, and if you choose "Other", please use the comment box below to tell us more. Thank you! Choose all that apply. If "other" please indicate species in the comment box.